[Updated with video] The Bermuda Police Service unveiled their Strategic Plan for 2016 to 2018, which they said comprises five areas of strategic focus for the next three calendar years, commencing in January 2016. 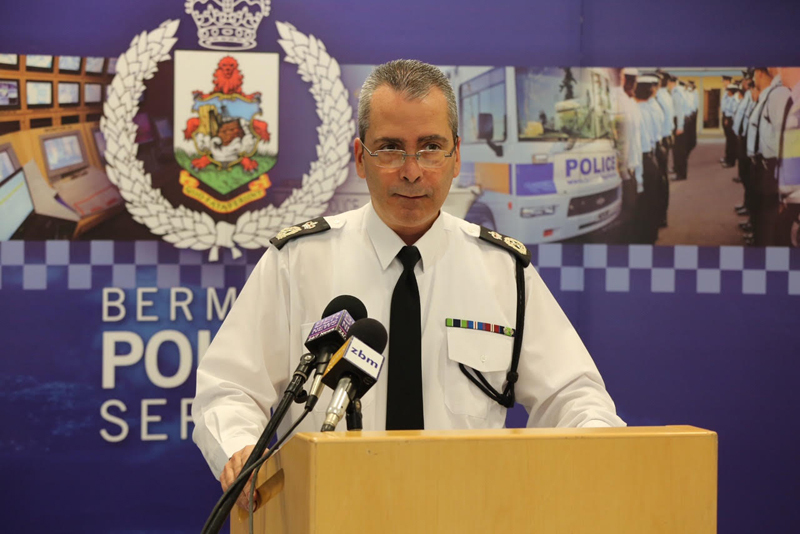 Speaking at a press conference today [Dec 9] Commissioner of Police Michael DeSilva said, “It is my privilege to present the Bermuda Police Service Strategic Plan for the period 2016 to 2018. The plan comprises five areas of strategic focus for the next three calendar years, commencing in January 2016. “Specific objectives for each of those years will be provided in the form of separate Annual Policing Plans that will coincide with the Government’s financial years from 1st April until the following 31st March. “When setting strategic direction for the police service it is important to consider together the needs and views of Government House, the Bermuda Government and the police on the management of crime, good order, public security and road safety, and the use of public funds towards these ends. “The needs of the community are also important, and to those ends this document represents collaboration between the police, the public and the government. Consultation was also held throughout the Police Service and included each body that represents our staff: the Bermuda Police Association, the Bermuda Public Services Union and the Bermuda Industrial Union. “This year, for the first time, we invited a number of private citizens to form an ad-hoc advisory group to be part of the planning process, and we are grateful for their voluntary assistance in helping to shape the final document. “1. Tackling Crime and Antisocial Behaviour: including gangs and violence, working with International Law Enforcement Agencies to help guard Bermuda against the vulnerability of terrorism, organized crime and cybercrime, as well as working with local criminal justice partners to explore a system of Restorative Justice for Bermuda to help provide relief to victims and reduce offending. “2. Engaging with the community: this sits at the core of our operations and includes neighbourhood policing, youth engagement that is aimed at keeping young people out of the criminal justice system, child safeguarding, and making good use of traditional and social media to stay connected with the community. “3. Making the Roads Safer: we launched a Road Safety Strategy in January of this year. It is a community collaboration that is designed to save lives, make our roads safer and increase public confidence. It balances robust enforcement with discretion and aims to influence driving behaviour, calm the roads, and reduce road deaths and impaired driving. 4. Investing in Our People: this includes the delivery of a Transformational Leadership programme that focuses on diversity, equality, occupational health and safety, professional development and professional standards. “5. Optimizing Technology: we are committed to ensuring our technology provides modern, automated assistance to our operations while delivering value for money. We will consult with the Government to invest in technology that makes us more efficient at our job and contributes to public safety. 2. Provide highly visible front line policing. 3. Respond quickly to emergencies. 4. Conduct timely, quality focused investigations. “I believe this Strategic Plan will put the Bermuda Police Service in a good position to deal with change over the next three years. I am looking forward to delivering on this plan and I am encouraged about the future changes and improvements that its implementation will bring about. Yes thank you Police for booking me $300 fine for tapping my gas pedal on east broadway. I only went 60kph for like two seconds max if that, and in response I have to pay $300. Thank you so much Police. You are so fair. Had I been traveling at that speed perhaps I would not be disgruntled. But now we live in a culture where Police have forced us to live in fear of our speedometers. THAT IS DISTRACTED DRIVING. WHICH IS DANGEROUS. Yes, Police don’t want us to use “devices” while driving, or we are bad people, right? Ask any moron on the planet and they will tell you it is STUPID and dangerous to keep looking at your speedo. It can KILL. But Police don’t care about that. They don’t actually care about lives or road safety, why would they? They just develop and enforce a culture where you MUST SIMPLY MUST look at your speedo and be distracted every TWO SECONDS or ELSE YOU LOSE YOUR PAYCHECK! And thanks Police for once again taking my hard earned money, about half a paycheck for this little mistake. Im soooo sorry I went an extra 5mph for one or two seconds…. Dear me, what a bad person I must be! And the sick joke is when I go to court the judge fines me $300 for 60kph. and he gave 69kph a fine of $300. So since I did 60kph how on bloody earth is it JUST OR FAIR I get $300 fine? I got the same penalty as someone driving while using a cellphone. EXCUSE ME?!?!?! ISn’t that suposed to be akin to drunk driving? Dangerous driving? But about 30 people got $300 fines for cell phones while driving and I get same fine for doing 60kph for 2 seconds? I guess I might as well have been using my cellphone and driving at 69kph cuz apparently our justice system doesn’t recognize any difference! DERP DE DERP!!! Proof all they care about is that MONEY MONEY MONEY! Well, when everyone starts colliding into the back of someone while checking my speedo ever two seconds, maybe then the Police will grow some cells in their hearts and brains and make some sensible and long-overdue CHANGES. Perhaps people should start airing the dirty laundry about how cops let each other off for speeding all the time…………. LAW STATES I GOTTA SEE PROOF AND YOU NEVER GAVE ME ANY. HOW DO I KNOW YOU ARE NOT LYING? POlice gotta make their quota every year, fact, thats why they go out and book us like hotcakes in december so they can get their raises and smiles from their bosses! oooooh goody! Merry Christmas!!!!!!!!!! And thanks for the extortion-based system which is our speed-court system. Yeah so if you don’t wanna plead guilty to something they did not prove you did, you have to hire a lawywer, pay money, waste time, argue in court… just like mob extortion to make people pay up! You make it impossible for anyone to defend themselves! THANKS BUDDIES! HELL if I am reporting any crimes any more, you police can do your own jobs! You must be just 18 , bless . Relax ! One day when you’re all grown up and actually know how to operate a vehicle you won’t have to look at your speedo to know how fast you’re going . Plus , if you just ‘tapped’ your pedal and hit 60k you were already more than likely doing over 50k anyway . And you do know the speed limit is 35k , eh ? And you’re lucky to have just gotten the $300 fine . I know someone who got (on their 1st offense ever ) the $300 fine and 6 months off the road ! Take some responsibility for your actions and stop being such a whiner. You are obviously a young’un. When I started driving there was a cop behind every darn bush, hiding in driveways, or ready to pounce at the favourite locations, such as East Broadway (by Crow Lane Bakery) or at the bottom of Strawberry Hill etc. You think the cops are bad now? Hilarious. 60 kph would have gotten you a fine AND 6 months off the road then as well. Hopefully part of their plan is to find our missing $800m! This plan is recycled and tired. I guess it’s Bermudas very own Jade Helm 16. “people are you ready”…jus a line from a song which came to mind. Did they ever catch the mini bank robbers? when are we getting the on spot breath test ? I guess we just continue to kick that can down the road ! An app for realtime video of crime taking place…and a service to receive and dispatch as required…put it on google play and after courtcase is seen to and finished put film on a websight called name and shame .bm and charge a monthly fee..